Epiphone listened—and the Epiphone PRO-1 Acoustic Collection provides the solution. Drawing on over 140 years of experience, Epiphone luthiers have re-invented the acoustic guitar to create an instrument that’s easy to get started on but sounds so good you’ll keep playing it all your life. Say goodbye to the “learning guitar” blues and hello to the joy of playing music on a new family of fine instruments from Epiphone! The PRO-1 Spanish Classic is modeled after the world’s top classical guitars and features the same tonewoods used to make the best classical instruments. Classical guitars are renown for offering players incredible tone. And the PRO-1 Classic's balanced sound and PRO features makes it easy for a new player to discover their unique “voice" on guitar. The PRO-1 Spanish Classic has a Laminated Cedar top with beautiful 4-layer Black and Ivory binding and features all of the PRO Collection's breakthrough innovations. Epiphone, one of the world’s oldest and most respected guitar makers, has just made playing and learning guitar easy for everyone. Designed by Professionals to be EASY to PLAY! Creating a truly easy-to-play guitar wasn’t easy. And at Epiphone, we take making a great guitar seriously, no matter what the player’s level. So, Epiphone rethought the guitar from top to bottom to make an instrument that anyone can play right away. The result is a truly “PRO” guitar that’s easy to play, easy to own, and most importantly, delivers the full, vibrant sound that Epiphone is known for. The PRO-1 Spanish Classic is the result of exhaustive analysis, numerous technological innovations, and suggestions from a “who’s who” of professional players. And now it’s time to play! Less fatigue - Wrap your hand around the PRO-1 Spanish Classic neck and you’ll immediately feel how comfortable it is. Our new EZ-Profile™ neck is designed so your hand can easily form chords without feeling fatigued. Effortless Fretting - Epiphone’s new JumboPRO™ frets make fretting notes and chords seem effortless. JumboPRO™ frets are taller and wider than smaller frets. So, when you push down a string, it’s easier to make string contact with the fret, creating less hand fatigue and finger friction. No pain, no gain? - Nonsense—Epiphone believes in “no pain.” Lighter gauge strings are easier to play so every PRO-1 is set-up and equipped with Epiphone Ultra-Light strings. Easy action - With Epiphone’s Dual-Action truss rod, you can adjust the neck in both directions, which not only stabilizes the neck but also makes set-up easier and more precise. 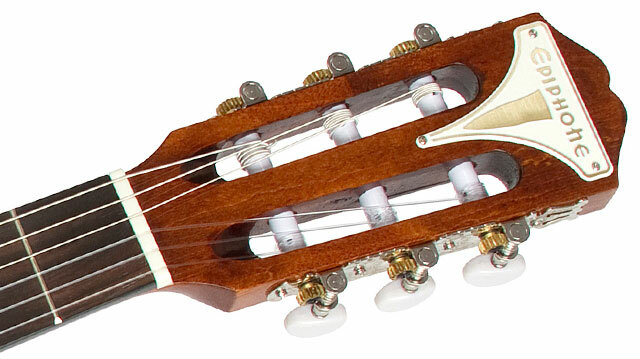 Each PRO-1 Spanish Classic also includes a humidifier to help keep your guitar’s moisture level just right. And, the Laminated Cedar top with Custom PRO-Prietary™ Bracing is “sealed” to help further protect your PRO-1 Spanish Classic against environmental changes such as extreme humidity or dryness. The PRO-1 Spanish Classic is available in Antique Natural. Tools of the Trade Included! The PRO-1 Spanish Classic includes a Sound Hole Humidifier to protect your precision instrument from moisture and environmental changes, a Tips and Tricks Book with tips on getting the most from your guitar, and free online lessons from eMedia. An optional AccessoryPRO™ Kit is also available to enhance your experience as you progress. Also check out the optional PRO-1 Accessory Kit which gives you everything you need to keep your guitar in tip top condition including 2 sets of PRO-1 Epiphone Ultra-Light Classical Strings, PRO-Ease lubricant, a chromatic headstock tuner, string winder, guitar polish and cloth, an Epiphone strap, and picks. Epiphone has been making professional quality instruments since 1873 and every PRO-1 Spanish Classic is backed by Epiphone’s Limited Lifetime Warranty and Gibson’s legendary 24/7/365 Customer Service. Visit your Authorized Epiphone Dealer today and discover how easy it is to learn guitar with the Epiphone PRO-1 Spanish Classic. The PRO-1 Spanish Classic is a classical style acoustic guitar with a Laminated Cedar top. Cedar is one of the "tonewoods" preferred by classical guitar luthiers for its "sweet" and individual sound. The PRO-1’s Custom PRO-Prietary™ Bracing allows the natural tone of the Laminated Cedar top to ring out with clear highs and balanced lows so a player can easily hear their progress as they develop their guitar vocabulary with chords and runs. The PRO-1 Spanish Classic uses Mahogany for the back, sides, and neck. Mahogany is also a favored tonewood for classical guitars and is a perfect compliment to the Laminated Cedar top, helping to acoustically amplify the PRO-1 Spanish Classic’s incredible tone and also provide the guitar with a stable foundation in any environment. The beauty of both Cedar and Mahogany gives the PRO-1 Spanish Classic a sophisticated profile. Plus, the PRO-1 Spanish Classic has a reduced body depth which makes it easy to hold for long hours of playing. The PRO- Spanish Classic has an EZ-Profile™ “D” Shape neck with a traditional 2.0” nut width, a tradition for classical guitars slightly wider then a conventional acoustic guitar. Another innovation the PRO-1 Spanish Classic offers is a shorter scale, which makes learning chords faster. PRO-Ease™ Lubricant makes the neck feel smooth and “worn in” on your fingers, and JumboPRO™ frets make it easy to hold down Epiphone’s custom Light Gauge Classical strings. A guitar that plays this easy has to be able to get in tune and stay in tune fast. The PRO-1 Spanish Classic features Epiphone Deluxe tuners, which have 16:1 ratio tuning gears that help make finding the right pitch quick and intuitive. Ordinary classical guitar tuners have only a 14:1 ratio, which makes fine tuning difficult, as the string never quite settles in the right place. But tuning is easy with the PRO-1 Spanish Classic because the higher 16:1 gear ratio lets you adjust your tuning with greater precision so it’s easier to find the right pitch and stay there.